“Um, Mom? I think something happened to someone at school,” my high school freshman said cautiously from the backseat of the car. “What do you mean?” I asked. “I’m seeing stuff on Snapchat,” she replied. A quick visit to my emails on my phone confirmed her words. The principal at my children’s high school had sent a letter to parents informing us of the “sudden death of a current student.” My heart sank. Just a mere four months earlier our school community had received a similar email, and it shook my son, a high school junior, to his core. Parenting is not easy. Each stage brings its own set of challenges. When asked, most of us would define parenting success as children who are happy and healthy. But what importance does resilience play in their lives? 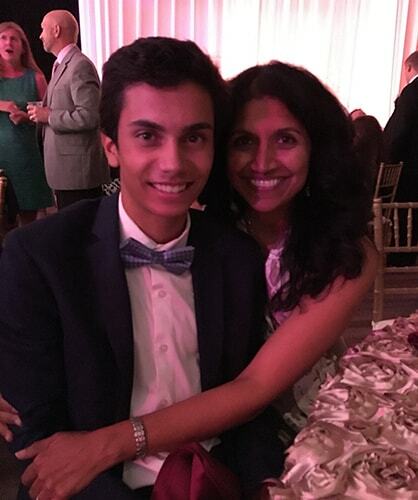 At the start of my son’s junior year, I learned just how resilient he is. When school began last August, one of my son’s best friends took his own life. Even writing these words seems surreal. When I say he was one of his best friends, I mean that this young man was like a brother to my son. Back in seventh grade, when we moved my son from our small Catholic school to the large public school, this young man was one of the first to befriend him. They connected immediately as they were both funny, sensitive boys. Their friendship was a beautiful thing to witness. The news of his passing was a gut punch that sent us into a tailspin. Our entire family loved this young man. The week following the news was a blur of emotions: shock, sadness, guilt. My husband and I did our best to offer our son a safe space to display his feelings. If he was angry and just wanted to throw something, we wanted him to. If he was brokenhearted and just wanted to cry, we wanted him to. If he was in denial and just needed to sit and play video games, we wanted him to. We knew eventually these pockets of emotions would make way for his true feelings. We knew eventually he’d want to talk about what happened. Or so we thought. When children lose a peer it upends all they know to be true. Walking alongside a child who is grieving is unlike anything else. When children lose a peer it upends all they know to be true. The counselors at my kids’ school met with parents to share their knowledge and experience. They reassured us that the faculty and staff would keep an eye on our kids, that their doors were always open should they need to talk. All of my son’s teachers and coaches knew that he was personally affected, and they offered kind words and emails. Whatever accommodations he might need, they were ready to give. The only glitch was that he was not ready for any of it. He refused to speak with counselors at the school. He felt the eyes of his teachers looking at him differently. He thought the coaches were going easy on him. All of this he equated to special attention and he wanted no part of it. We knew he was hurting, but he would not share his pain with his father and me. So we tried to be patient and give him time. The weeks passed into months, and I watched him lose his joy. There were moments of smiles or laughter, but his heart was broken. He found it difficult to concentrate in school. He would turn down invitations from friends in favor of his room, his laptop, and Netflix. He was angry at God and felt no comfort or peace in attending church service with us. He wasn’t eating or sleeping well. My normally soft-spoken son would fly off the handle from time to time. Although he did not display any of the destructive behaviors that the school counselors warned us of, I was worried. I felt like I was watching him slip away from the amazing person he had grown into. Parenting him for the first seventeen years of his life was nothing compared to this. I simply did not know how to help him. So I did what I knew best—I continued to love him. I loved him through a perpetually messy room. I loved him through forgotten homework assignments. I loved him through neglected household chores. I loved him through a disappointing basketball tryout. I loved him through a traffic ticket. I loved him through text messages filled with goofy memes found on the internet. My love for him was all I had left. I also prayed and I asked everyone I knew to pray for him. Then, between my smothering love and the prayers, I saw it happen. His resilience began to break through. He started engaging with us and others again. He was smiling more. Signs of his former self were emerging. He was willing to meet with a counselor, one who specializes in helping teens. He still doesn’t talk about what happened freely, but if questioned he shares a bit of his heart. Of course as his mother I want him to unload all that he’s been holding on to, but I also know I can’t ask for more than he’s willing to give. I want him to know that after a loss like this, with some resilience, there can be joy once again. Nothing prepares us to parent a child through grief. We all just want what is best for our children. We want to be able to right the wrongs in their lives. That’s what I wanted. I wanted to mend his broken heart. In a world where results and reactions are so immediate, patience became my mantra. The road to healing will be a long one, and he has just begun that journey. But he&apos;s also showing just how resilient he is. It is something for which I am incredibly grateful. This will shape the man my son becomes. He will make decisions based on this experience. When he hears the news of another loss of life at such a young age, it will bring his emotions right back to the surface. It is a part of his story. My hope and prayer for him is that he will always carry the memory of his dear friend with him. I want him to accept his diploma for both of them at their high school graduation. I want him to take him along to college in a year. I want him to think of him when he gets a job and buys a car. I want that precious friendship to be ever present. I want him to know that after a loss like this, with some resilience, there can be joy once again. Ila Rosengarten lives in Littleton, Colorado with her husband and three children. She received her BA in English from Boston College and works in College Counseling at Mullen High School in Denver. Some of her work can be found on the Grown and Flown website as well as the GOPIO organization website.